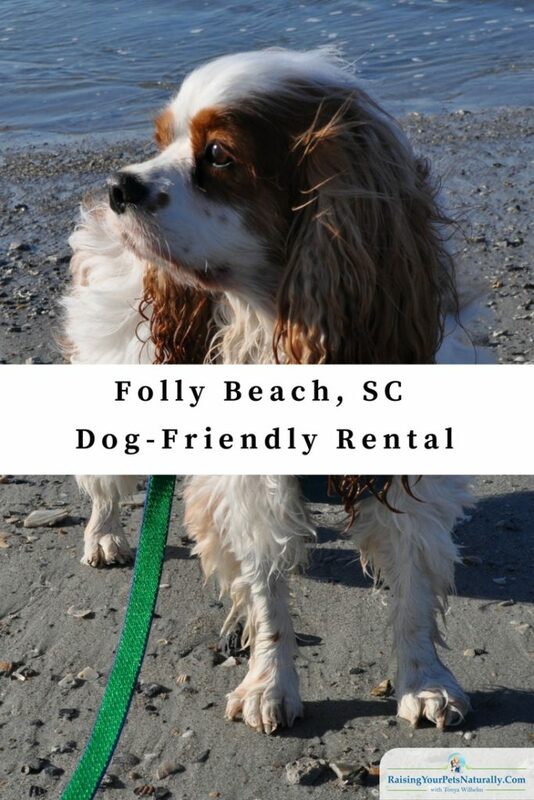 The family decided to take our spring dog-friendly vacation to South Carolina and stay in Folly Beach. We are most defiantly a beach family. We rented “Close To The Edge,” a great 3-bedroom beach house rental through VRBO (Vacation Rentals By Owner, part of the HomeAway Family). This pet-friendly Folly Beach rental home was bright, open, and roomy. The 3-bedroom rental had a master bedroom with a master bath, plus two standard bedrooms and another full bath. The bedrooms were very nice, comfortable, and provided plenty of space for our human family of three and Dexter The Dog. Hardwood floors ran throughout the home, which made sandy clean up a breeze. This dog-friendly vacation rental was very clean, neat and modern, yet felt homey and comfortable. The home had a full kitchen, dining room and living room, cable, Wi-Fi, wrap-around porch and fenced-in yard! It was a dog lover’s dream. The neighborhood was quiet and friendly and we were only five minutes from the ocean and fifteen minutes away from Charleston, South Carolina. This was a prime spot for our family vacation. Dexter enjoyed the large fenced-in yard for potty breaks and playtime. We also brought a gate to close the front porch in so Dexter could roam the wrap-around porch. We enjoyed our afternoons and evenings relaxing on the deck and watching the lizards. I can highly recommend booking through VRBO and staying at Close To The Edge in Folly Beach, South Carolina. The dog-friendly rental home was well cared for, immaculate, close to our daily adventures, and perfect for a dog. Are you and your dog or pets beach goers? Tell me in the comments. Such a cute furbaby. I loved when I traveled with my boy! Thank you. Traveling with Dexter is my favorite activity. 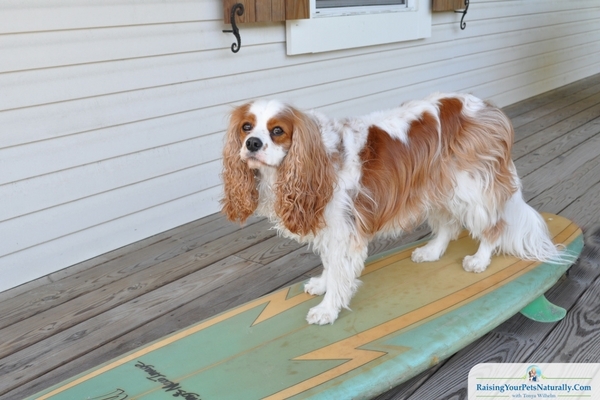 I think Dex would love to surf! He has been on a small kid’s paddle board thing. I held it, he stood on it. I have a Dog. I feel very sad when I use to go on vacations cause I have to leave her under care of some other people. A part of mind always think about her that time. I wish I could take her with me. That’s hard. 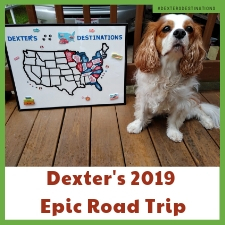 We plan all of our vacations around Dexter. He’s a big part of our family circle. I love South Carolina! 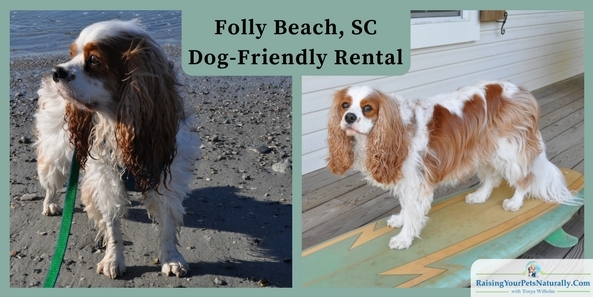 NOt sure much about pet friendly places but we have been to Folly Beach and its lovely! I love South Carolina too! It’s such a nice state and very friendly. Folly Beach was so laid back and beautiful. This sounds like another fun place to visit! Love the surfboard pick – did you catch any waves? I went to Folly Beach one time and I was not a big fan. Now you have me thinking about giving it another try. Oh, no. Yes, we had a great time. A few nice places to eat too. Loved the beach! Noone in our family is very big on going to the beach. We don’t travel as a family much but on the rae instances we do he’s happy here at home with a family friend. Ya, not everyone is a beach family. We love the beach. We used to love taking our dog on family camping trips when I was a kid. She definitely loved the beach! Same here! Our family trips when I was a kid included a tent. Now, not so much. A rental home is usually the way we go. This sounded like a good balance of comfort and freedom. Spending some time at the beach must have been super nice! You got that right. It was very nice and relaxing. So great to be able to take your fabulous dog on holidays. This beach sounds perfect and so dog friendly with those dog homes for rental. We don’t have anything like this in Ireland. It was amazing. Oh, that’s too bad. Ireland looks like an amazing place. What an awesome post! I am curious does the pup surf? That would be an awesome trick! Thanks. No. I won’t allow him in the ocean. I’m too scared! He can stand on a kid’s board in the lake, but hasn’t caught a wave. 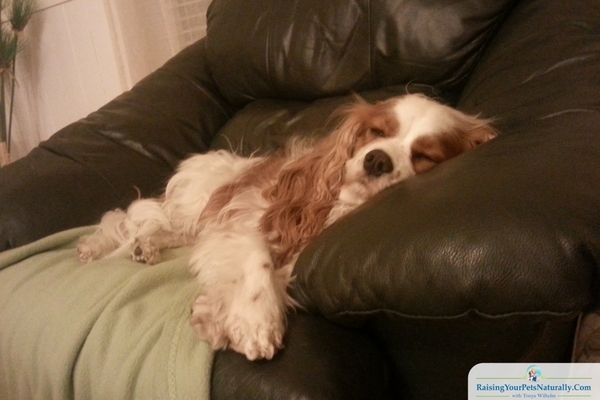 Dexter looks so comfy on that sofa! 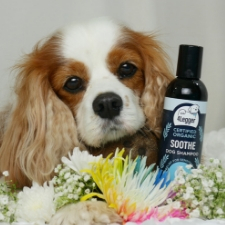 Travelling with our pup is so hard to do with many hotels not accepting guests with pets. That can be tough. We definitely have to plan ahead. That’s great to take your dog on holiday! We always leave our dog at home as there aren’t many dog friendly holiday spots over here! He quite enjoys his little stay at my parents though! I love taking Dexter. It’s all about Dexter in our home. Glad your little one enjoys grandma’s! This is good information to know for dog owners. 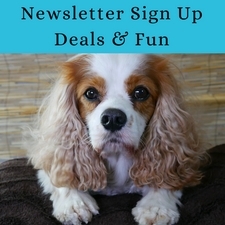 No hassle of paying a pet sitter. We just visited a resort that allowed pets. My sons enjoyed seeing everyone enjoying their vacation with their fur babies. How fun. Dexter is used to kids (adults too) coming up to him and saying hi. I think Dexter finds that part of the vacation extra special. Pet friendly places are the best. I don’t have a dog but my uncle does & it breaks his heart to go on a vacation without his dog. That’s so sad. Dexter enjoys are family vacations so much. I can’t imagine traveling any other way. Our pets deserve some vacation as well. I think it’s awesome to take them to the beach and let them have fun! Exactly. They love the quality time with their humans. A great time to bond and connect. I would love to take my dog Riley to a beach somewhere and just spend time with him. Thanks for sharing this I hope we get to plan a vacation here sometime soon! Do it! Hanging on the beach with your best dog is just amazing. We’re huge fans of taking our dogs with us when we go on vacation. If not .. I think about them the whole time. Pet friendly places are some of the best .. there aren’t nicer people than dog people! It’s great that when you go on vacation there are places where you can take your four legged companion with you as well. 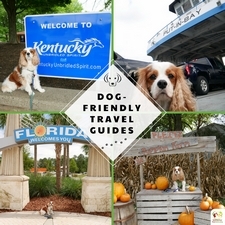 I don’t have a dog (just cats), but I do know how important there is for some people to bring their pets with them on vacation and how hard sometimes it is to find a dog-friendly destination. My best friend lives in Charleston and she has a dog. 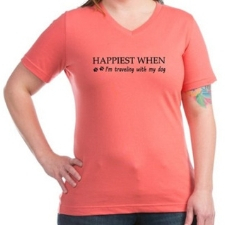 She takes him to Folly Beach all the time. That’s awesome~ Folly Beach is amazing. We had a day trip in Charleston, SC too. It was a lot of fun. We hope to go back soon. I don;t have any pets, but your pet seems to be so cute. I know my friends always struggle to find dog friendly beaches. Thanks. 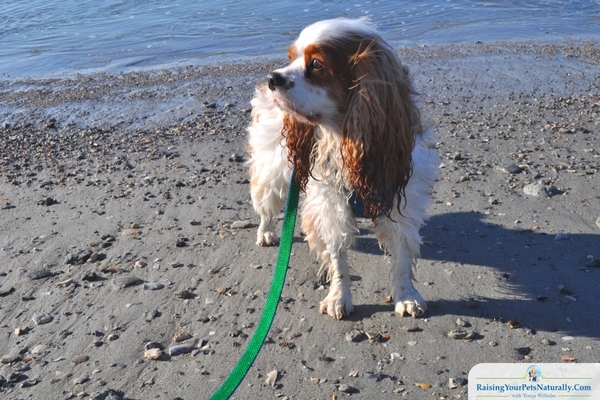 Yes, finding nice dog-friendly beaches can be a challenge. Folly Beach is a winner!